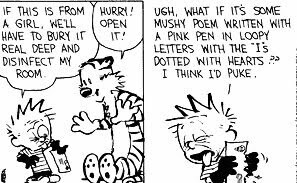 Zoran, a frequent commenter posted some great Calvin and Hobbes strips awhile ago and I've been meaning to link to them. I stopped reading comics strips in the 1970s when amateur artists began dominating the papers, but now and then I would notice a small handful of strips that stood out as the last lights flickering in the dim twilight of post-hippie decline of western culture. 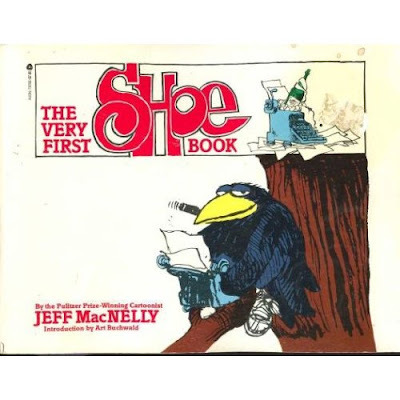 One was "Shoe" by Jeff MacNelly and later I noticed Calvin and Hobbes. 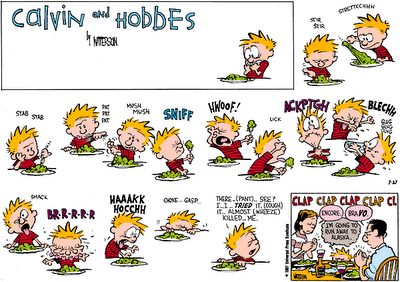 I don't know a lot about the strip or its creator, Bill Watterson, except that Calvin is obviously drawn really well. Zoran did this great post showing that he even uses lots of custom-tailored poses and expressions, rather than the simple cookie-cutter repeated frames that so many comic strip artists rely on. This is rare for comics strips in its whole history - let alone in the 80s or 90s. Too bad Watterson left the field when he seemed to have been its last hope.